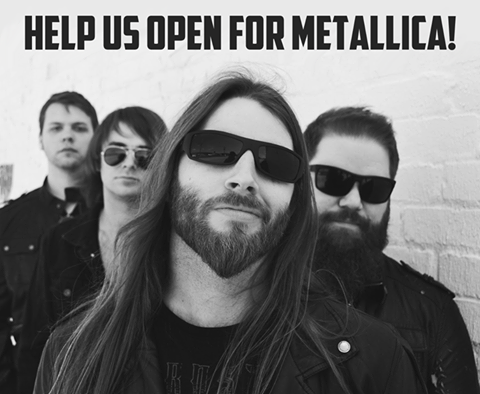 Vote TROY to Hit the Stage and open for Metallica: Final Round! TROY nation! The saga continues! We officially moved into round two of the Hit the Stage contest hosted by Metallica! Thank you to everyone for the votes and helping us to get that much closer to hitting the stage with gods of rock but now we must ask for your final votes to help us seal the deal. TROY is one of eight finalists left in this contest and every vote counts! Voting is now done at Metallica.com and there is no sign-up process in order to vote. Follow the link below for a direct line to the official page for the “Hit the Stage” contest where the voting poll can be found. Vote and help us spread the word by sharing this story or interacting with our Facebook page. Voting ends April 25th. TICKET GIVEAWAY: We are hosting a voting contest of our own from our Facebook page that includes a ticket giveaway for two tickets to the Metallica show in St. Louis if TROY is selected as the Final winner in the Hit the Stage contest! Follow the link to our page for further details on how to get a chance to win! Thank you TROY nation for all of your continued support – we would not be here if it weren’t for our amazing fans!